Rickie Fowler Engaged-To-Get Married With Girlfriend; 'Best Friend' To Be Wife - Details! Home » News » Rickie Fowler Engaged-To-Get Married With Girlfriend; 'Best Friend' To Be Wife - Details! Congratulations are in order for Rickie Fowler! American professional golfer Rickie has finally turned his best friend-like-girlfriend, Allison Stokke: a fitness athlete and model, into his fiancee. Interstingly, Rickie proposed his lady on the Southampton beach in the National Best Friend's Day on 9 June 2018 and announced the good news via his Instagram on the same day. He uploaded two pictures on his Instagram. One picture that captured the moment when Rickie got one-knee to propose to Allison, and the other captured the moment when his fiancee flaunted her huge and shiny engagement ring. In the caption, he revealed that he succeeded to lock down his best friend for life. Allison also took the happy news on her Instagram and posted the pictures of her engagement on 9 June 2018. She scripted the caption as, "Yes!!!!!!!!!!!!!!!!!!!!!!!!!!!!!!!!!! And happy national best friend day to my best best best friend! I love you!!!" After a day of their engagement, the newly engaged couple celebrated their union at an intimate US Open kickoff party hosted by Rickie's close pal Mike Meldman. American singer Kelley James serenaded the couple at the bash that took place at Dune Deck Beach Club in Westhampton Beach, New York. Rickie, who belongs to mixed ethnicity, is in a relationship with Allison since May 2017. Rickie was first spotted on a date with the pole vaulter at the MotoGP Grand Prix of America. They made their relationship Instagram official by uploading adorable pictures with each other and also showcasing their affection. The lovebirds have leaped to their engagement within a year of dating. So, it is quite sure that they are entirely into one another. Perhaps they will tie the wedding knots and get married soon to call each other husband and wife. 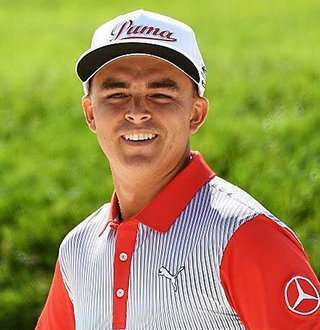 As of now, the four-time PGA winner Rickie, who hails from a family where his parents are a racer, is probably focusing on winning 2018's US Open. The annual national championship of golf will take place at Shinnecock Hills Golf Club from 14 June 2018. Openly Gay Russell Tovey Splits With Boyfriend-Turned-Fiancé; Memories Gets Wip Out!